On Friday, July 13, SAAPRI and the Kalapriya Center for Indian Performing Arts, in collaboration with the Chicago Park District, conducted its second event in a series of Night Out in the Park events titled “Ahimsa: The End of Violence.” The event was held in Shedd Park, located on the west side of Chicago in the Little Village neighborhood, and consisted of a dance performance by Kalapriya artists and students from Joyce Kilmer Elementary and John J. Pershing Magnet School. The performance was followed by a panel discussion consisting of community leaders who reflected on the themes of violence and justice. Kalapriya artists and students depict the story of Angulimala and the Buddha through traditional Indian dance and music. 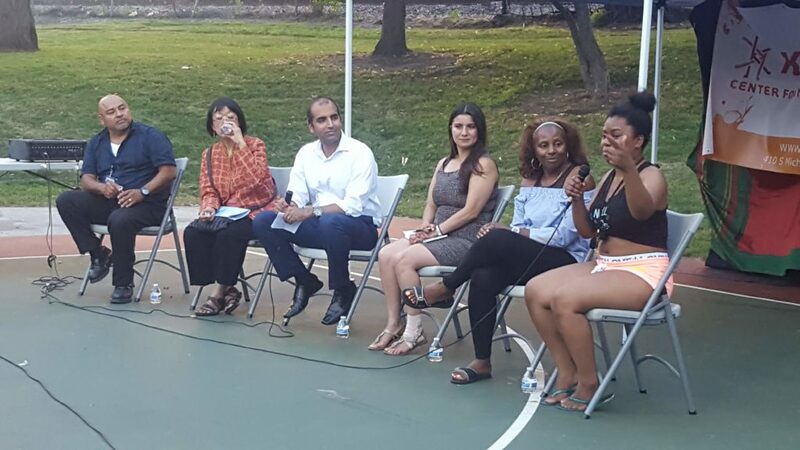 The program was truly a unique approach to combating violence in Chicago communities as it brought together traditional Indian dance, international storytelling, students from different backgrounds and neighborhoods, and reflections from the community. 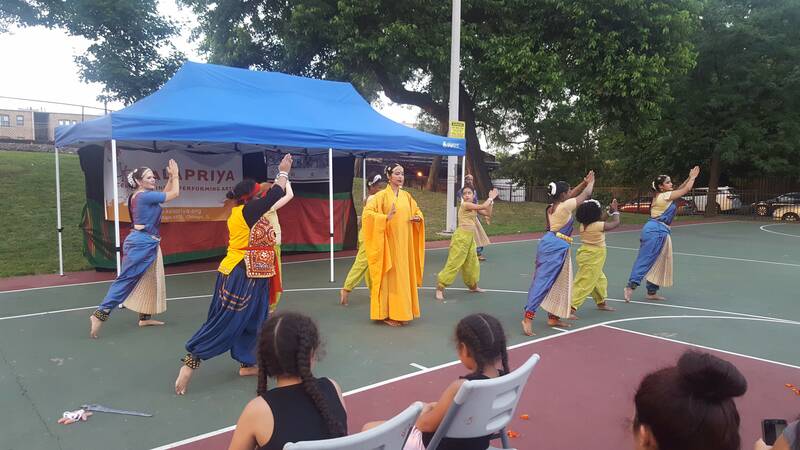 The Kalapriya students performed narrative dances depicting three different stories from Ancient Greece, 19th Century America, and Ancient India, with each story serving as a meditation on nonviolence and justice. 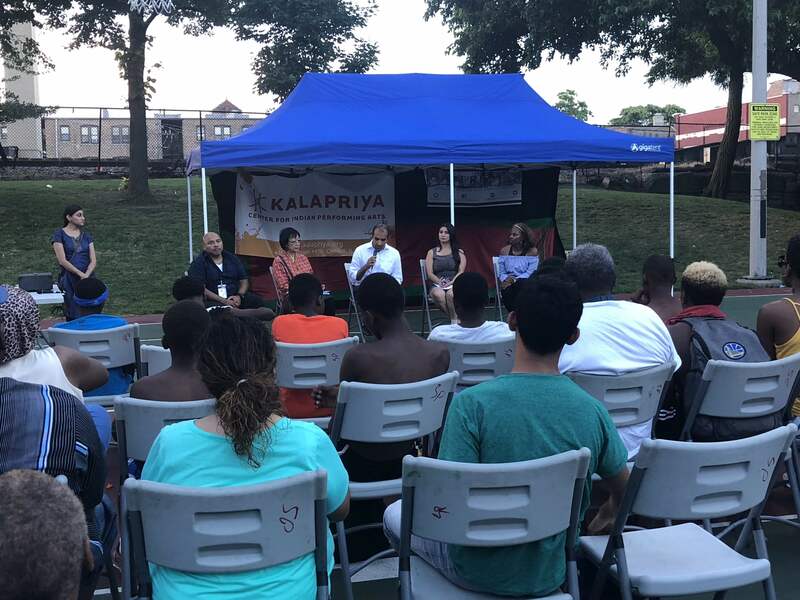 Ahimsa showcased how individuals from different cultures and neighborhoods can unite in the face of violence, which was reflected in the diversity of Kalapriya performers, panelists, and audience. In a city as segregated as Chicago, this was a welcome sight. “I applaud the organizers of this event because look around – this is one of the most diverse groups I’ve seen in my regular life” commented Dr. Yvonne Lau, Dean of Academics and Career Pathways at Instituto Del Progreso Latino. Panel Discussion moderated by Tejas Shah (Board Member of SAAPRI) with Sixto Torres (Dean of Students for Instituto Del Progreso Latino Leadership Academy), Dr. Yvonne Lau (Dean of Academics and Career Pathways at Instituto Del Progreso Latino), Alma Anaya (Cook County Commissioner – Elect of the 7th District), and Wanda Norris (Youth Minister and Supervisor of Shedd Park). Youth leader Mary Kenya passionately explains how young people in her community experience violence, and praises those in her neighborhood that are making a difference. To close the community discussion, panelists were asked to respond to those who claim that those who are the loudest, most aggressive, and threaten violence get the furthest in the fight for justice. The group consensus was that Ahimsa (the concept of nonviolence towards all), peaceful protest, advocating to our representatives, and engaging with our communities in a positive way will ensure safety, peace, and progress. Missed the event in Shedd Park? There are two more Ahimsa programs open to the public at Oz Park on Friday, July 20th, and at Indian Boundary Park on Saturday, August 11th. RSVP today!